Cannabis appears to be THE drug austim patients and families have been waiting for. Autism affects 1 in 68 children, and it is one of the fastest-growing developmental disorders in the United States. Some of the more extreme symptoms include rage, panic, property destruction and injuries, as well as severe communication deficits, according to the Autism Research Institute. In many cases, family members lose their emotional connection and communication with the children, and it can be such a huge challenge for everyone involved. However, thanks to recent testimonials and trials, parents and physicians are counting on cannabis as the best bet for the harsh realities of those affected. Cannabis is helping patients as well as their caretakers, who suffer immensely too. “Cannabis helps ameliorate symptoms, especially the most severe symptoms like self-injury or aggressive behavior and low appetite/weight loss. It can also help improve communication and cooperation,” said Dr. Dustin Sulak, a Diplomat of the American Academy of Cannabinoid Medicine. 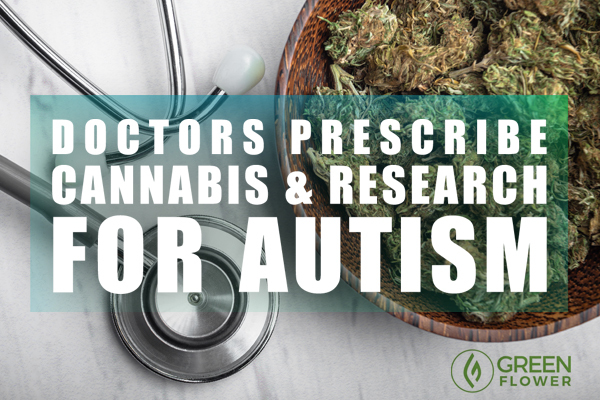 “It appears to me that my autistic patients feel more comfortable in their bodies with the help of cannabis, and are more likely to make eye contact, initiate interaction, and even give hugs,” he explained in a recent interview. Sulak, a Doctor of Osteopathy, treats over 18,000 patients with medical cannabis through his integrative health practices in the state of Maine. Although autism is not a listed condition in Maine’s medical cannabis law, Sulak can treat autistic patients who have other conditions such as seizures, spasticity, chronic pain, and movement disorders. In one case, Dr. Sulak had a patient who had autism and spoke only with one word responses. After his first treatment of cannabis, “he had a remarkable two-week period when he was speaking complete sentences,” Sulak said. Unfortunately, the improvement gradually regressed, but cannabis still helps with his behavioral challenges. Myths and negative stigmas may surround the THC in cannabis, but Dr. Sulak has found it very useful, especially with urgent implications for tantrums. “For severe behavioral symptoms, and even mild ones, don’t be afraid to try THC. Based on my clinical experience, THC is well tolerated and very effective in autism. Like most other conditions, it’s likely that some combination of THC and CBD will be best for most patients,” Dr. Sulak said. Sulak recalled another patient who was banging his head through walls. He needed to be restrained regularly to prevent him from harm. That young adult has been stable for three years now on a low dose of THC. He’s even employed, and living a productive life. Some patients, even children, require a high-dose of THC, about 50 to 200 mg. It helps them feel calm, connect to others, and settle down to sleep. The medicine also stimulates their appetite enough for them to focus on meals, he explained. Despite the high dose and psychoactive properties of the plant, Dr. Sulak has observed no signs of impairment or intoxication after administrating both THC and CBD to his patients . Could Cannabis Be the BEST Treatment for Autism? Currently, conventional medicine does not have many treatments that are effective for the inappropriate inflammation and dysfunction that autism presents in the body’s central nervous system and gut, Dr. Sulak explained. “The best case scenario would be to find a treatment that is safe, decreases inflammation, protects and promotes healing in the nervous system and gut, and helps manage the most severe symptoms of autism. Cannabis seems to fit that description,” Dr. Sulak said. Sulak points out the need for more research on overall efficacy as well as dosing nuances. As for long-term effects, he is hopeful that the herb will address the underlying pathology by protecting the nervous system, promoting neuroplasticity, and reducing inflammation. Few research studies on cannabis and autism exist due to the U.S. federal government’s scheduling of the plant as a dangerous substance, which it is not. Because of all the restrictions, many parents are forced to take matters into their own hands for the lives of their children. Mieko Hester-Perez chose the unconventional cannabis route when she was told her son Joey might not last the year. The greatest threat to her son’s well-being seemed to be the 13 FDA-approved medications he was prescribed. Side effects from the ineffective, legal drugs included facial ticks, seizures, and liver damage, and Joey was also experiencing dangerous weight loss. After she gave her fragile, uncommunicative 10-year-old boy cannabis medicine, not only was Joey able to put on weight, but he began to play with his toys and smile. Soon after, he began making regular eye contact, which is always a challenge with autism. Six years after his six-month-terminal prognosis, Joey was instead living a happy life, thanks to cannabis and his mom, who went on to assist with the development of “Joey’s Strain,” a cannabis variety for autism’s core symptoms. Several of these suffering parents are raising money for autism studies. They know they have cannabis to thank for their new connection with their children, and the sense of peace that their families previously lacked. Now able to care for their kids without fear of the next violent episode, they are joining forces to help others find their way to this ancient medicinal herb. If you'd like to learn more about the fundraiser for a new clinical autism study, you can check out their campaign here. Should autism patients be allowed to try cannabis? American Hemp Set to Skyrocket in 2017? Could Police Help End the War on Drugs?